From time to time, PVRRG will conduct polls of interest to the community, and in the spirit of transparency, the results will be shown on this website on this tab and on the tab to the relevant issue. The polls will be publicized on NextDoor.com as well as to our mailing list. If you'd like to receive these notifications, please sign up for the mailing list here. In the April 2018 Election, voters approved Measure E by a small margin (130 votes). To gain insights into residents' perceptions on the issues, PVrrg has launched a poll that should take less than four minutes to complete. It is confidential, and we hope that whether voters voted "yes"or "no", we welcome all perspectives. For the full report, click here. The report includes links to sources for the true facts relating to each question. 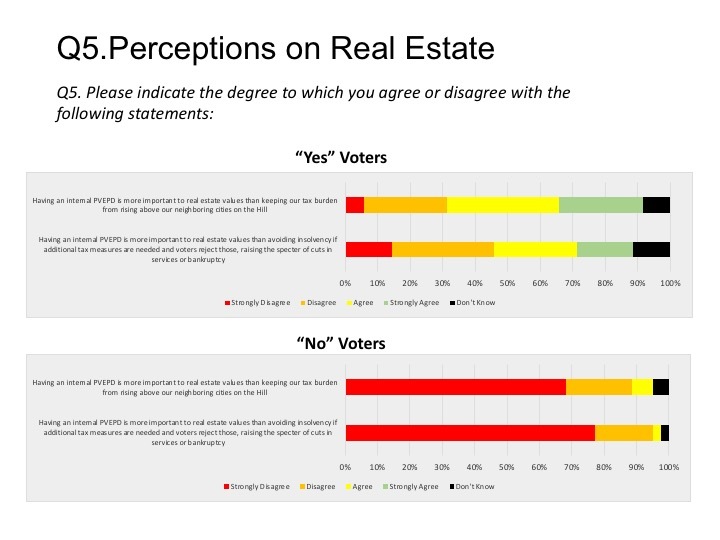 Here are some highlights from the 154 respondents -- 56 voting "Yes", 90 Voting "No" and 8 "Did Not Vote." This is a sufficient sample size to help understand what was driving the voting on both sides of the issue. All responses are confidential and the results are published for the public and the City of Palos Verdes Estates to see on this website. The survey takes less than two minutes (click here to take the poll). The poll was taken between March 13, 2017 and April 10, 2017. 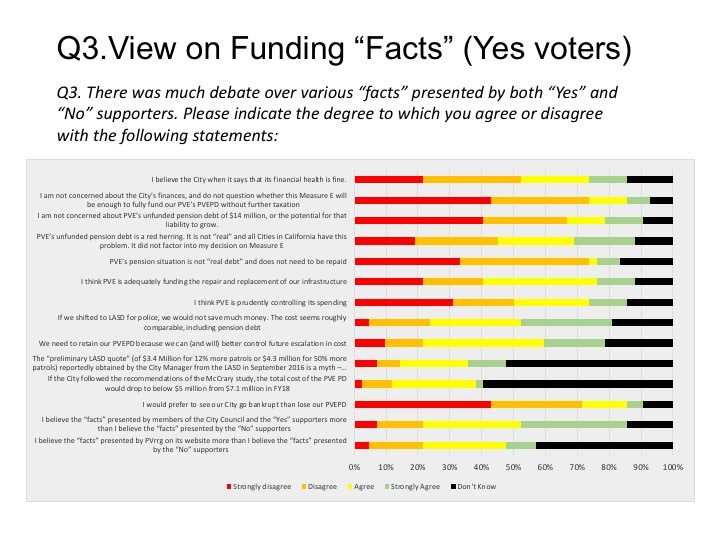 For the full report including 39 specific comments collected from the "no voters" and 25 comments from the "yes" voters, click here. The poll will close on March 27, and the report will be updated and made available to the City Council and to the public. The Poll was confidential and took place between February 16, 2017 and March 17, 2017. There were 88 Respondents, and all but one said they were PVE residents. 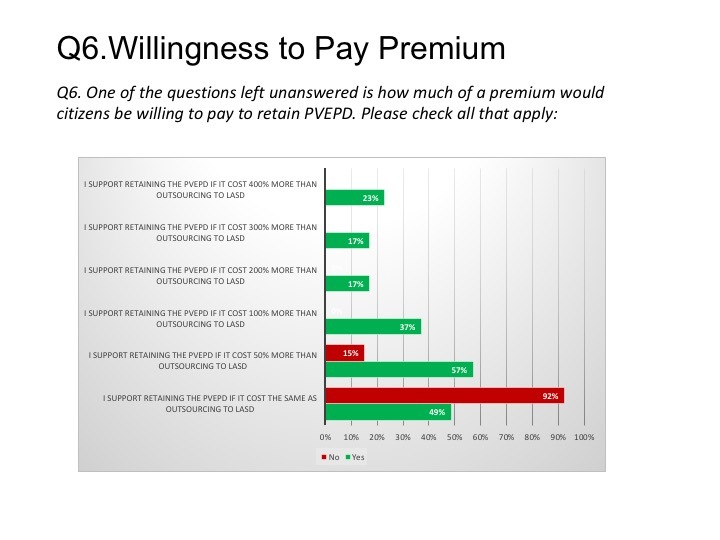 89% of the respondents had voted in the recent PVHA Election, and the others provided input on why they did not vote. "...Indeed, as stated above, nearly two-thirds of our members who took our survey want MCHA to write a letter of support for the Platform. Hence, we are stating here that MCHA recommends that City leaders integrate the Platform’s principles, as well as the attached MCHA member feedback, into your efforts to improve roadway safety in PVE." Read the letter and endorsement here. 65% support the Roadway Safety Guiding Principles Platform (9% disagree)"
See details of the survey here, including instructive comments from individual respondents. Your voice matters, so please participate!